For the dish, see Pongal (dish). Thai Pongal (Tamil: தைப்பொங்கல், /ˈθaɪˈpoʊŋʌl/) is a harvest festival dedicated to the Sun God. It is a four-day festival which according to the Tamil calendar is usually celebrated from January 14 to January 17. Thai Pongal corresponds to Makara Sankranthi, the harvest festival celebrated throughout India. Presenting Pongal to Hindu Sun God, Temple Prayers and sharing Pongal dish. Thai Pongal is one of the most important festivals celebrated by Tamil people in the Indian state of Tamil Nadu, the Indian Union Territory of Puducherry, and the country of Sri Lanka, as well as Tamils worldwide, including those in Malaysia, Mauritius, South Africa, United States, Singapore, Canada and UK. The day marks the start of the sun's six-month-long journey northwards (the Uttaraayanam). This also corresponds to the Indic solstice when the sun purportedly enters the 10th house of the Indian zodiac Makara or Capricorn. Thai Pongal is mainly celebrated to convey appreciation to the Sun God for a successful harvest. Part of the celebration is the boiling of the first rice of the season consecrated to the Sun - the Surya Maangalyam. Thai refers to the name of the tenth month in the Tamil calendar, Thai (தை). Pongal usually means festivity or celebration; more specifically Pongal is translated as "boiling over" or "overflow." Pongal is also the name of a sweetened dish of rice boiled with lentils that is ritually consumed on this day. Symbolically, pongal signifies the gradual heating of the earth as the Sun travels northward toward the equinox. This day coincides with Makara Sankranthi which is celebrated throughout India, Nepal and Bangladesh. Besides rice and milk the ingredients of this sweet dish include cardamom, raisins, Green gram (split), and cashew nuts. Cooking is done in sunlight, usually in a porch or courtyard, as the dish is dedicated to the Sun god, Surya. The cooking is done in a clay pot that is decorated with coloured patterns called kolam. Pongal has two variants, one sweet and one savoury. The dish is served on banana leaves. Cooking pongal is a traditional practice at Hindu temples during any part of the Temple Festival in Tamil Nadu. The day preceding Pongal is called Bhogi. On this day people discard old belongings and celebrate new possessions. The disposal of worn-out items is similar to the traditions of Holika in North India. The people assemble at dawn in Tamil Nadu to light a bonfire in order to burn the discards. Houses are cleaned, painted and decorated to give a festive look. The horns of oxen and buffaloes are painted in villages. In Tamil Nadu farmers keep medicinal herb (neem, avram, sankranti) in northeast corner of each fields, to prevent crops from diseases and pests. Bhogi is also observed on the same day in Andhra Pradesh. 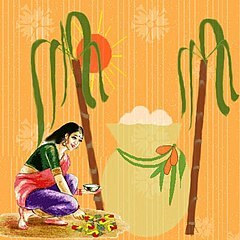 In the ceremony called Bhogi Pallu, fruits of the harvest such as regi pallu and sugar cane are collected along with flowers of the season. Money is often placed into a mixture of treats and is poured over children. The children then separate and collect the money and sweet fruits. The main event, also known as Thai Pongal, takes place on the second of the four days. This day coincides with Makara Sankranthi, a winter harvest festival celebrated throughout India. The day marks the start of the Uttarayana, the day of the Indic solstice when the sun purportedly enters the 10th house of the Indian zodiac i.e. Makara or Capricorn. In the Tamil language the word Pongal means "overflowing," signifying abundance and prosperity. During the festival, milk is cooked in a vessel. When it starts to bubble and overflows out of the vessel, freshly harvested rice grains are added to the pot. At the same time other participants blow a conch called the sanggu and shout "Pongalo Pongal!" They also recite "Thai Pirandhal Vazhi Pirakkum" ("the commencement of Thai paves the way for new opportunities"). This is repeated frequently during the Pongal festival. The Pongal is then served to everyone in the house along with savories and sweets such as vadai, murukku, paayasam. Tamilians decorate their homes with banana and mango leaves and embellish the floor with decorative patterns drawn using rice flour. kolams/rangolis are drawn on doorsteps. Family elders present gifts to the young. Newly cooked rice and savouries prepped for celebrating pongal. The Sun stands for "Pratyaksha Brahman" - the manifest God, who symbolizes the one, non-dual, self-effulgent, glorious divinity blessing one and all tirelessly. The Sun is the one who transcends time and also the one who rotates the proverbial wheel of time. Maatu Pongal is celebrated the day after Thai Pongal. Tamils regard cattle as sources of wealth for providing dairy products, fertilizer, and labor for plowing and transportation. On Maatu Pongal, cattle are recognized and afforded affectionately. Features of the day include games such as the Jallikkattu and taming bull. Kanu Pidi is a tradition for women and young girls. During Kanu Pidi women feed birds and pray for their brothers' well being. As part of the "Kaka pidi, Kanu pidi" feast women and girls place a feast of colored rice, cooked vegetables, banana and sweet pongal on ginger or turmeric leaves for crows to share and enjoy. During this time women offer prayers in the hope that brother-sister ties remain forever strong as they do in a crow family. On this day celebrants bathe and decorate their cattle with garlands. Cows are decorated with manjalthanni (turmeric water) and oil. Shikakai apply kungumam (kumkum) to their foreheads, paint their horns, and feed them a mixture of venn pongal, jaggery, honey, banana and other fruits. In the evening people pray to Lord Ganesh. One ritual is to light a torch of coconut leaves and carry it around cattle three times and then run to the border of the village to drop it. This is believed to remove the evil influences caused by the jealousy of other people over the cattle. Kaanum Pongal, the fourth day of the festival, marks the end of Pongal festivities for the year. The word kaanum in this context means "to visit." Many families hold reunions on this day. Brothers pay special tribute to their married sisters by giving gifts as affirmation of their filial love. Landlords present gifts of food, clothes and money to their tenants. Villagers visit relatives and friends while in the cities people flock to beaches and theme parks with their families. Celebrants chew sugar cane and again decorate their houses with kolam. Relatives and friends receive thanks for their assistance supporting the harvest. In Andhra Pradesh, Mukkanuma, the final day of Sankranthi festival, is celebrated by worshiping cattle. Mukkanuma is famous among non-vegetarians. People do not eat non-vegetarian dishes during the first three days of the festival, saving them for the day of Mukkanuma. In 2017, Delegate David Bulova introduced a joint resolution HJ573 in the Virginia House of Delegates to designate January 14 of each year as Pongal Day. ^ "2017 Marathi Calendar Panchang". Retrieved 3 November 2016. ^ "Pongal - Harvest Festival". ^ "Thai Pongal celebrated across the globe". Retrieved 4 July 2015. ^ a b "Meaning of 'Thai Pongal' - TAMIL NADU - The Hindu". Retrieved 4 July 2015. ^ a b Ellis, Royston (19 July 2011). , 4th: The Bradt Travel Guide. Bradt Travel Guides. p. 61. ISBN 978-1-84162-346-7. Retrieved 3 January 2012. ^ Richmond, Simon (15 January 2007). Malaysia, Singapore and Brunei. Lonely Planet. p. 490. ISBN 978-1-74059-708-1. Retrieved 3 January 2012. ^ "Jaffna Hindu College :: Thai Pongal tomorrow, Thursday 15 Jan 2015". Retrieved 4 July 2015. ^ "Thai Pongal தை பொங்கல் Festival 2015 | University of Sri Jayewardenepura, Sri Lanka". Retrieved 4 July 2015. ^ "Washington Embassy celebrates Thai Pongal | Embassy of Sri Lanka – Washington DC USA". Retrieved 4 July 2015. ^ "Malaysian Prime Minister Greets Ethnic Tamils on Pongal". Retrieved 4 July 2015. ^ "Najib extends Pongal wishes to Indian community | Malaysia | Malay Mail Online". Retrieved 4 July 2015. ^ ". :: Midrand Hindu Dharma Sabha | Hindu Festivals - Prayer Dates - Religious Calendar - 2015 - 2016 ::". Retrieved 4 July 2015. ^ "History of the Tamil Diaspora (V. Sivasupramaniam)". Retrieved 4 July 2015. ^ "Newspaper Full Page - The Straits Times, 14 January 1937, Page 5". Retrieved 4 July 2015. ^ "Minister Kenney issues statement to mark Thai Pongal". Retrieved 4 July 2015. ^ "» Statement by Liberal Party of Canada Leader Justin Trudeau on Thai Pongal". Retrieved 4 July 2015. ^ "Community celebrates Thai Pongal harvest festival (From Harrow Times)". Retrieved 4 July 2015. ^ "Hindu Festivals". AHA Shiva Vishnu Temple. Retrieved 28 January 2015. ^ "Makar Sankranti". Society for Confluence of Festivals in India. ^ Sachchidananda; Prasad, R. R. (1996). Encyclopaedic profile of Indian tribes. Discovery Publishing House. p. 183. ISBN 978-81-7141-298-3. Retrieved 3 January 2012. ^ "ஏறு தழுவுதல் (ஜல்லிக்கட்டு) வரலாறு". tamil.oneindia.com. Retrieved 16 January 2016. Saveri, Nicholapillai Maria (2001). Jaffna The Land of the Lute. Thirumarai Kalamanram Publications. p. 125. ISBN 0-9681597-0-2. Wikimedia Commons has media related to Pongal.